You'll be £12.99 closer to your next £10.00 credit when you purchase Maidstone in the Great War. What's this? Maidstone in the Great War tells the remarkable story of this Kent county town's immense contribution to the Great War effort from the outbreak of war in 1914, to the long-awaited Allied victory in 1918. Maidstone has a long and illustrious military history it even had its own Civil War battle, dating back to 1648 and with the onset of the First World War, its civilians, like thousands of communities up and down the country, sent their men off to fight for their king and country. The town paid a hefty price as it lost nearly 900 of its young men. The harbinger of death catered for all strands of society, from the richest to the poorest, from those who toiled in the fields, to the loftiest of society. The book looks at the war year by year and how it directly and indirectly affected Maidstone. As more and more of its young men were killed and wounded, everyday life, or what passed for everyday life, continued the best that it could. The town's incredible support for the war on the Home Front was apparent from the very beginning. When the Mayor of Maidstone appealed to the town's people to support Lord Kitchener's request for blankets for his New Army, they responded in their droves. Convalescing soldiers were tended to as passionately as Belgium refugees were looked after by the town's people; they freely and happily did this while coping with the unsettling reality that one or more of their loved ones may never return from the war. This is a superb account of the people of Maidstone's outstanding determination to see the war through. 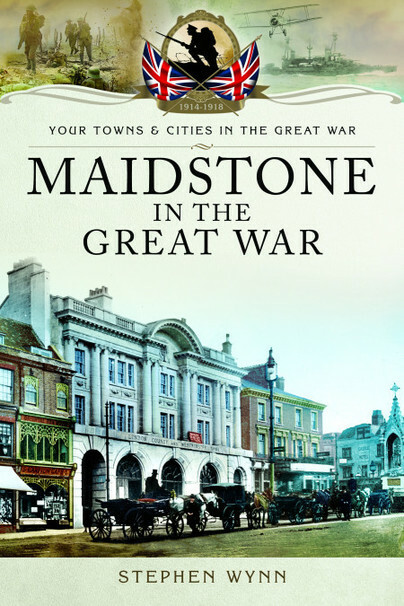 This book is excellent value, full of superb photographs, along with statistics that make this both an interesting and easy read about life in Maidstone during the Great War, and an invaluable historic reference book. This is a superb account of the people of Maidstone's outstanding determination to see the war through.